Morning Program (2 1⁄2 – 4 1⁄2 years) 8:00 a.m. – 12:30 p.m.
Full Day Primary (4 1⁄2 to 6+ years) 8:00 a.m. – 3:00 p.m. Elementary Program (6 – 12 years) 8:00 a.m. – 3:00 p.m.
Children are dropped off and picked up by parents and persons approved by parents at the side entrance (driveway loop) of the school. Tardiness is disruptive to the classes and is not helpful to the school in carrying out its responsibility to educate each and every child. PLEASE MAKE ALL EFFORT TO BE ON TIME CONSISTENTLY. Full Day Primary and Elementary aftercare begins 3:30 p.m. to 5:00 p.m. Please note: Children picked up after designated pick up time will be placed in aftercare and aftercare fees will apply. Please refer to the Parent Handbook for more information about aftercare fees. Find out about our after school enrichment programs, which are offered throughout the year. How do I know if St. Croix Montessori is the right fit for my child(ren) and me? Montessori education is based on a strong foundation of research and practice. It prepares students for society, encourages their natural curiosity, and teaches them self-discipline and respect for difference. The best way to discover if our program fits your desires for a healthy education for your child(ren) is to visit! Watch our brief school video tour, then schedule an observation and/or tour of our school. What clothing/shoes are suitable for school? Clothing should be comfortable and suitable for school. St. Croix Montessori students are very active playing in our outdoor environment so shoes must be safe, protective and easy to wear. Flip-flops, boots, ballet flats and fashion shoes are not permitted for outside play. Primary children need to be able to use the bathroom without assistance with their clothing. We ask that our children avoid characters, slogans, and sports teams on their clothing. More specifics are outlined in the Parent Handbook. What do I send for lunch? Parents are asked to provide a healthy, well-rounded lunch and a reusable water bottle (16 oz. or more). 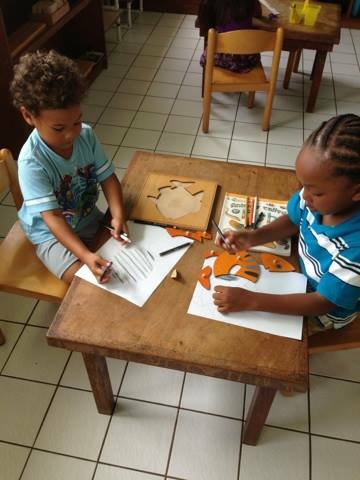 St. Croix Montessori will provide utensils, plates, and glasses. We live in the Caribbean and ask that children bring their lunches in a labeled, insulated, standard-size lunch kit. Uneaten food will be sent home to help parents determine the appropriate portions needed for their children. Please use a thermos/ice pack for foods requiring refrigeration. Please Do Not Send: Foods that require that require preparation beyond simple re-heating. Select Fridays have an optional $5 lunch program. We have partnered with local restaurants to provide a balanced meal. Parents should still send water and a snack on Fridays if they choose to participate. We do not allow fast food, juice, soda, or candy in lunches. These will be sent home. As part of our learning environment, St. Croix Montessori children are involved in preparing and serving a morning snack. Snack is made available generally around 9:15AM and is out for an hour, providing children the opportunity for seconds. We ask that parents make sure their children still eat breakfast before school. Parents should pack an additional snack for their children for the afternoon and to eat during aftercare. Primary Program: Parents are assigned a week to bring healthy foods for the class’ morning snack. We love receiving donations of extra fruit and veggies from home gardens! Elementary Program: Parents provide a fee for the semester so that St. Croix Montessori can provide our Elementary students nutritious options for their growing bodies and minds. In addition, Elementary students have the opportunity to choose a “Going Out” program in which they plan a snack menu, purchase snack supplies at the grocery, and cook a healthy snack for their class. Not only are students applying their language, math, and reading skills – they have fun! When is tuition due and what form of payment do you accept? There are 3 tuition plans available. It can be paid in full at the beginning of the year, in 2 payments, or in 10 monthly installments August-May (due the 1st of each month). Personal checks, credit card (Visa, MC), cash, and money orders are accepted. Please note a late fee will apply for payments made after the 5th of each month. Refer to your tuition agreement contract for details. How can I help “Recycle, Reuse, Reduce” at St. Croix Montessori? St. Croix Montessori encourages parents, children, and staff to be aware of the amount of garbage and trash generated by fast foods and pre-packaged foods, etc. We ask all of the St. Croix Montessori Community to be involved and please send all food items in reusable containers. FOR FURTHER INFORMATION ABOUT CLASSROOM GUIDELINES, SAFETY, ETC. PLEASE REFER TO THE PARENT HANDBOOK.